The sale of these yearbooks is restricted to alumni, their family and Muir staff for their personal, private and non-commercial use. These yearbooks are NOT for sale to any person or entity whose purpose is to resale these yearbooks in whole or part or for any other commercial use. If your intent is purchase a yearbook for uses other than to view them, please seek another source for your purchase. These yearbooks are protected by copyright laws of the United States. We reserve the right to refuse sale to anyone. Those are the titles of the different yearbooks that have been published at Muir. The Sequoian was the first yearbook and it was printed from 1929 to 1938. Then in 1939 Muir became a military base, so there were no yearbooks published from 1939 to 1946. In 1947 the government released the land back to Pasadena and again, the Muir campus was open for learning. The book was then titled "Roundup" for the next chapter of the school. In 1955 Muir became the high school that we know today. A lot of fond memories can be brought to mind by leafing through the pages of your old high school yearbook; most of them happy and memorable of times past. But, for some, your yearbook may have been lost you may never have purchased one. Well, all is not lost because we have originals of the Muir High School yearbooks dating back to the beginning when the mascot was a Terrier (yep we used be "dogs" just like PHS) and the colors were orange and gray. So if you can't locate your yearbook, we might be able to help. Unfortunately, our yearbooks may not contain those wonderful and witty sayings that your classmates scribbled all over your book (ok, some of those sayings were pretty good, especially the ones I wrote, but I digress...). No, most of our books are actually in new, original condition; No broken spine, not a mark on them, pages waiting for that first viewing. They can bring back those fond memories with the photos of friends (some really unforgettable friends that you've forgotten anyway) and teachers; places you used to hang out, clothes you can't believe you used to wear (hey, look some are back in style again!) and look at the cars! Yep, those were good times. To preserve the content of all yearbooks and to make those books that are out of print, the Alumni Association had every yearbook professionally digitize. So yearbooks are available in digital format for your viewing pleasure on your computer. We will only sell the digital yearbook when the hard bound book is unavailable. Ok, so what is the price for those fond memories you ask? Happiness starts at just $25.00 for digital copies and $35.00 (New pricing starting at $15) for hard bound books, including shipping, handling and tax. * Yearbooks published from 2010 through this year will be sold at original cost PLUS shipping, handling and tax. You may order any book ONLINE by clicking onto it below. 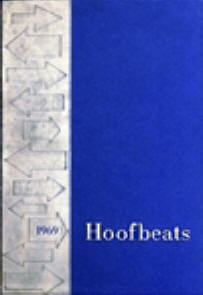 Hard bound, original, yearbooks are marked as "Book" and the electronic copies are marked as "Digital." If you do not wish to order online, you may order by mail using your personal check or U.S. Postal money order and this form. Buy Your Yearbook From the Author - John Muir High! 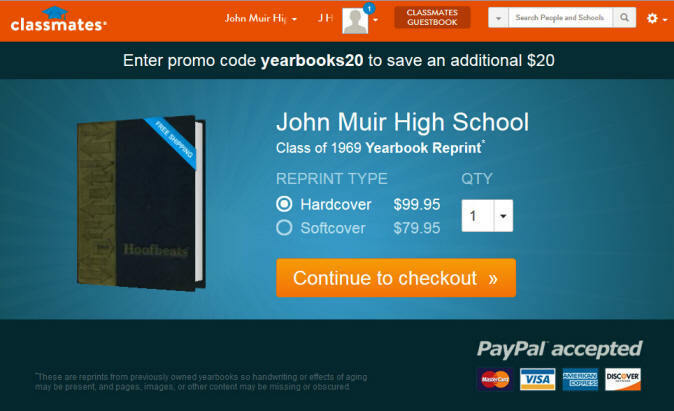 Why buy from Amazon or Classmates when you can own your old yearbook for less than half the cost and the knowledge that your purchase also helped your alma mater, John Muir High! Oh, did we mention our yearbooks aren't photocopies (they call 'em "paperbacks" in the ad), ours are originals. And for yearbooks out of print we have professionally digitized copies on CD (much better than photocopies) that can be viewed on your computer. One final comment, your purchase might be tax deductible from us, but probably not with Amazon or any other for-profit source. Wow, win-Win-WIN!!! It's like it's 1969 today. A Pristine book in excellent condition. Not a $59.95 "paperback" copy. Not a $99.95 "preprint" copy. It's a $35 original (just like it was in 1969) from the original author, taken from the school you attended and either forgot to purchase or you've lost your copy. And now it's on Sale for $15. Why would you want to pay Amazon or Classmates almost 8 times the price for a copy? We have every year from 1929 to 2015 available for sale. Buy your yearbook here and support your Alma Mater, too! Classmates wants almost $100 for the same book we're Selling for $15! Support Muir and maybe get a tax break, too! Original Yearbooks begin at $15 and Digital Copies are $25. Just click the "PURCHASE" button below the book you want to order. Shipping is included to the continental United States. Additional shipping charges apply to outside stated area. Delivery of yearbooks may take 7 to 15 days! The sale of these yearbooks is restricted to alumni, their family and Muir staff for their personal, private and non-commercial use. These yearbooks are NOT for sale to any person or entity whose purpose is to resell these yearbooks in whole or part or for any other commercial use. If your intent is purchase a yearbook for uses other than to view them, please seek another source for your purchase. These yearbooks are protected by copyright laws of the United States. We reserve the right to refuse sale to anyone. WE RESERVE THE RIGHT TO REFUSE SERVICE/SALES TO ANYONE! yearbook and refund your purchase. You have been forewarned.! 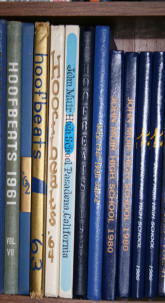 The sale of these yearbooks is restricted to alumni, their family and Muir staff for the sole purpose of personal, private and non-commercial use. These yearbooks are NOT for sale to any person or entity whose purpose is to resell these yearbooks in whole or part or for any other commercial use. If your intent is to purchase a yearbook for uses other than to view them, please seek another source for your purchase. These yearbooks are protected by copyright laws of the United States. We reserve the right to refuse sale to anyone. *All transactions are in US dollars. Shipping outside of the continental US will incur additional charges.